Unless you’ve been too busy prepping for the release (and are now playing) Blizzard’s Overwatch, then you should know that the market headlines are heating up with updates on a potential Brexit. Brexit is a nickname for “Britain’s Exit,” or the act of Britain saying “cheerio!” to the European Union (EU). As I mentioned in my Brexit Primer, the idea has been gaining traction for years, as Britons increasingly objected to the EU overstepping on the U.K. sovereignty; the perceived red tape for businesses, and, more recently, the limiting of the U.K.’s policies on foreign immigrants. The idea gained so much momentum that a promise of a referendum over the issue helped Prime Minister David Cameron and his Conservative Party win the 2015 elections. Cameron, not really a fan of Brexit himself, huddled with EU leaders to secure a deal that includes a lot more promises than Kim Kardashian has selfies. Despite having a “special status” with the EU though, the referendum will still push through on June 23. Those on the “Leave” camp point to the benefits of not having EU-related red tape and the U.K.’s freedom to implement its own policies on foreign immigrants. Meanwhile, those on team “Remain” warn of the risks and uncertainty over the unprecedented event. See, aside from the tariffs and other fees that would be imposed if the U.K. is no longer with the EU (which is where the U.K. sells most of its goods to), Britain leaving the EU will also cause political uncertainty for both parties. This is why BOE Governor Mark Carney, ECB head honcho Mario Draghi, and other economic hotshots have actively spoken of the negative impacts of such a decision. In line with that, it’s also why the pound (and sometimes the euro) tends to fall at releases of pro-Brexit headlines. How close are we to seeing a Brexit? Too close to call. 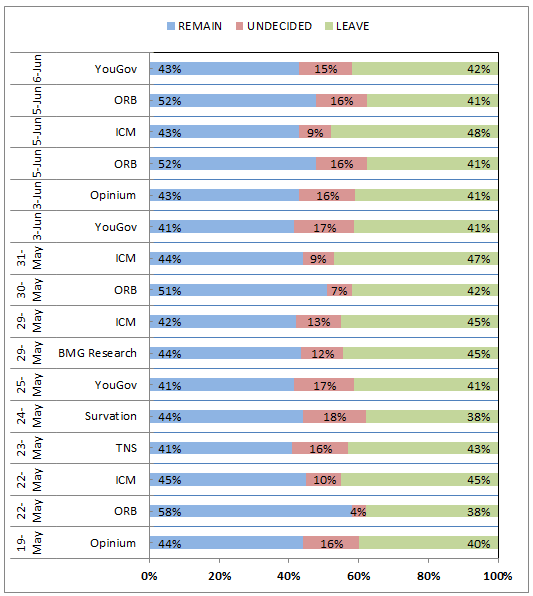 Just this week the pound opened with weekend gaps after Opinium released a poll showing a 5-point lead for the “leave” camp. What seemed like fiction a few months ago is now a very real possibility for the Britons. 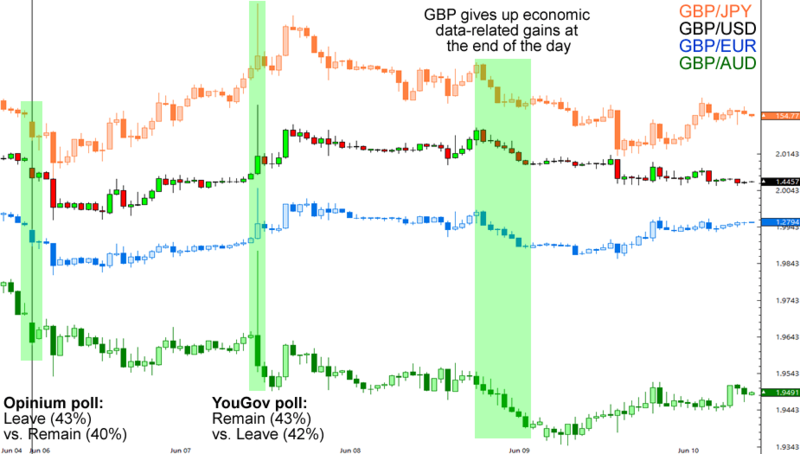 Then, around the middle of the week the currency spiked higher when YouGov’s poll showed a one-point lead for the anti-Brexit team. Talk about cutting it close! So how can forex traders take advantage of the issue? Well, forex traders may not like uncertainty, but they sure love their volatility! Right now pound traders are engrossed with the Brexit saga, enough for them to shrug off this week’s better-than-expected economic data and just rely on Brexit-related headlines. The correlation is pretty simple: Brexit = bad for GBP. In the days leading up to the referendum expect to see the pound respond less to the U.K.’s economic reports and trade more on Brexit-related updates. Any pro-Brexit poll is likely to weigh on the pound while anti-Brexit headlines could push the currency higher. Oh, and keep your eyes on the euro, too! Remember that any exit from the EU is likely to affect its common currency. Do I need to worry about an SNB-esque volatility? Since the vote is currently too close to call, it might be a good idea to lighten up your exposure ahead of the referendum. The unprecedented nature of a Brexit could expose you to more volatility than your account can handle. Remember the SNB shocker from last year? If you’re still planning on trading the event though, then you should at least take note of the changes your broker has made to cushion you against an account-geddon. Forex Ninja has a neat list of what the major brokers are doing so far!